A tiny fragment of genuine Czech Moldavite. Price is for one fragment that measures approx 10-11mm long by 4-7mm wide. 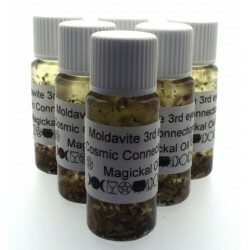 Moldavite was formed when a huge meteorite hit Czechoslovakia millions of years ago. Known as 'The Holy Grail Stone' it has strong connections with the spirit world.